We offer regular training programs to help you use our equipment effectively. The sessions are a combination of informative discussions and hands-on applications. All our programs are offered in our facilities in Burlington, Ontario, which are fully stocked with equipment, parts and accessories. Our one-day plastics welding course teaches basic knowledge covering hot air hand welding and extrusion welding techniques for plastic fabrication. The course consists of a theory section where participants will learn the knowledge needed to weld plastics and a hands-on section where participants will weld plastics using Leister hand tools and extrusion welders. This course is recommended for people interested in activities such as fabrication of plastic tanks and vessels, joining plastic pipe, and repair of plastic parts such as bumpers, recreational vehicles, tanks, etc. Individual attention is provided; space is limited to a maximum of four people per session. A light lunch is provided. The fee for this course is $199.00 plus taxes per person. Looking to send 3-4 employees for training? With a minimum of 3 participants registered from the same company we're happy to book a private course. Contact us for more details. 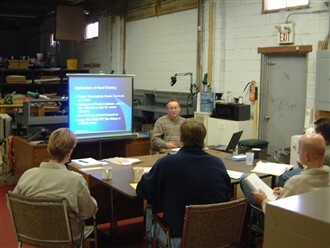 For training on our fabrics welding, roofing, flooring, or geomembrane tools please contact your sales representative.